Six Flags Fiesta Texas recently announced another expansion of the most terrifying Fright Fest ever. This year’s larger and more elaborate Fright Fest brings 28 nights of thrills and scares with a new haunted house, a new scare zone and a new live show. Haunted houses are included free with daily park admission. Located in Spassburg and established back at the turn-of-the-century, this museum of morbid collections plays host to numerous unique curiosities and cursed artifacts. Discover remnants from past sideshows and gruesome exhibits as the doors are finally cracked open once again after being closed for decades. Visitors will quickly discover the ghoulish previous residents are looking for new oddities to add to their fiendish collection of creepiness … getting in is the easy part. The Gully Washer entrance in Crackaxle Canyon takes guests through an abandoned campsite where people vanish and creatures of the night lurk for blood to feast on. The century’s old cemetery has been claiming more lives as those who dare continue to explore what lurks deep in the Blood Bayou. Voodoo spirits and mutant monsters will haunt the unsuspecting every step of the way. A frighteningly 3D crazed clown filled maze in Fiesta Bay Boardwalk with nightmarish illusions, all awaiting guests as they don 3D glasses. A dark, twisted circus of horrors with insane clowns who roam the halls waiting for new souls to prey on. This demented haunted house is a nightmare come to life filled with illusions that are triggered by interactive flashlights. Buried Alive exposes eerie tunnels and passageways long forgotten beneath Crackaxle Canyon. As guests descend into the bowels of the abandoned mine via a rusty, corroded elevator shaft, their mistake becomes all-too apparent. A complete colony of the un-dead beckons you through the labyrinth of catacombs to discover skeleton ghosts of miners that ventured through earlier. Take a ride on the carousel of the impaled, or step cautiously through the hall of maggots before witnessing the evening finale, a bizarre satanic ritual at the skeleton altar. Would anyone dare stop by and visit the most horrific haunted house in RockKill? The walking dead roam the halls of RockKill High School in hopes to tear away at fresh brains and flesh. This gory haunted house features the bloodiest undead creatures waiting for guests at every corner. The walking dead will be waiting for new bodies to walk through the bloodiest haunted house ever known, located in Rockville High nightly. Slaughterhouse 6 is a barn-full of screams and terror in Crackaxle Canyon. No one makes it out alive! Enter this primitive mansion of massacre and become a vegetarian forever! See your food chain too up-close-and-personal as creatures are led to slaughter where mistakes occur with alarming frequency. The new Soul Harvest in Texas State Square welcomes the clueless to an abandoned, dilapidated farm seemingly in the middle-of-nowhere. How did all these visitors arrive here on the night of a full moon, was it on a dare? It was supposed to be a fun, out-of-the-way road trip … now it seems to have taken a sinister turn. Will your friends and relatives ever see their friend again? Wicked Hollow allows the unsuspecting to enter a Pandora’s Box of secret rituals and strange clairvoyant traditions known only to those in the mysterious gypsy world. Maniacal wolves and witches fill the paths to destruction in Spassburg, where deranged puppets hypnotize guests to their ill-fated demise by a giant fire-breathing dragon! Aftermath is located between Spassburg and Crackaxle Canyon. The soothsayers were right! It’s the predicted end-of-times as guests enter Aftermath, where mere shells of humans wander aimlessly and their only focus is on discovering fresh human victims to extend their population. Encounter a hazy, burned-out environment that time forgot, with hollow-eyed inhabitants that can only communicate through primitive grunts and shrieks. Circus Berzerkus, in Fiesta Bay Boardwalk, is home to the most demented carnival of horrors on earth including demented clowns, sinister freaks, and creatures tormenting any living soul that wanders through. This twisted carnival plays with everyone’s mind as they walk the grounds of insane illusions. Who will be the next weary guest who dares to enter this sick and twisted sideshow? Zombie Apocalypse, (pictured above) located in RockKill, houses the walking dead roaming the empty streets aimlessly waiting for new survivors to wander through. The gruesome undead have escaped and now wander the streets looking for fresh brains and raw flesh to eat. They walk until tired guests can no longer escape! Twick or Tweat Meet-And-Gweet, located in the Kidzopolis area by Spassburg, meet the Looney Tunes characters in their finest Halloween attire as they hand out goodies for the littlest ghouls and goblins. Enjoy a new nighttime innovation in thrill ride technology and the world’s first-ever single rail Wonder Woman themed roller coaster — WONDER WOMAN: Golden Lasso Coaster. This cutting-edge marvel features a first-of-its-kind single I-beam rail with riders seated single file and their legs positioned on either side of the thin monorail track. This pioneering new design gives riders an open-air, unobstructed view as they twist and turn above the stunning 100-foot quarry walls. Also enjoy exhilarating park favorites such as BATMAN: The Ride, Superman Krypton Coaster, Goliath and for epic thrills enjoy the popular hybrid coaster — Iron Rattler. The entire park has an earie glow for the season, and in addition to the rides and attractions, themed décor at many culinary, retail and theater locations evokes a decidedly sinister tone. The fun show for the entire family that features eight energetic, elaborately costumed singer/dancers as they perform such hits as “Boogie Wonderland,” “Bad” and “Crazy.” This free-spirited seasonal celebration entertains guests at the Teatro Fiesta Theater as they enter Los Festivales. This spectacular, concert-style extravaganza brings all the creatures of the night together to summon the spirits with a raucous, edgy, rock-and-roll immersive experience at Lone Star Lil’s Amphitheater. A live band and dozens of highly talented performers in their finest costumes will knock out popular classic rock and top-40 hits. Pyrotechnics, video projection and flame effects add to the sensory experience. Start the evening off with a “group scare” as all the monsters, ghouls, villains, henchmen, skeletons, and creatures of the underworld make their debut at 7 p.m. each evening by scattering en masse from surprise locations and surrounding unsuspecting guests. These creatures of the night have waited all year to be reunited with the living just as the sun begins to set and the tone is set for the remainder of the evening. A live band adds to the excitement of a Halloween classic-rock show with strong lead vocals. Set in the Crackaxle Canyon’s Sundance Theater, this live trip into a Rockin’ Halloween will have guests singing along to all their tunes. 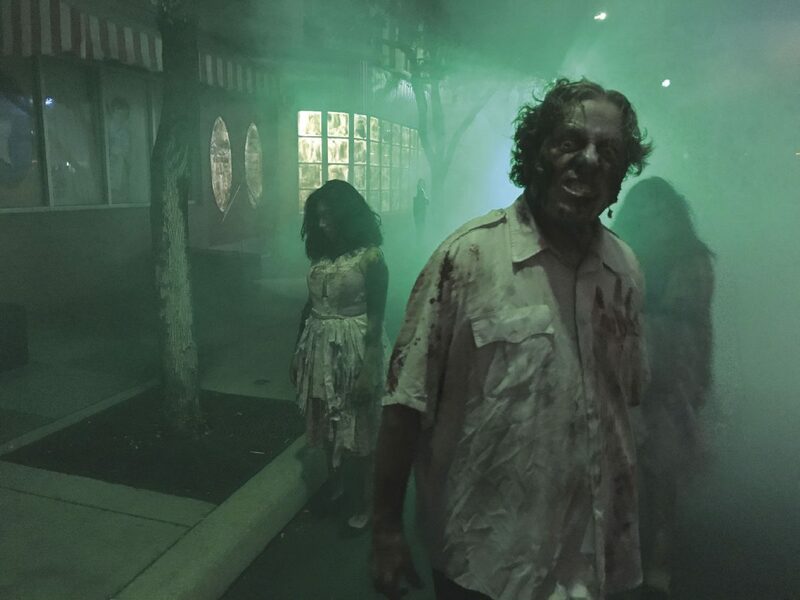 Fright Fest runs Fridays, Saturdays through Oct. 28. Fiesta Texas will also be open Monday through Wednesday, Oct. 29 to 31. All haunts, scare zones, and shows are now included in daily ticket admission. A variety of Haunted House priority passes are also available allowing for one-time or unlimited express line access. Follow @monitornews on Instagram for a chance to win Six Flags Fiesta Texas tickets. More details will be available next week.